As 5th and 6th graders encounter the Bible, they are challenged to think for themselves and apply what they are learning to their lives. The interactive, illustrated Bible study, application activities, Bible and memory drills, time line, maps and more are all designed to help them dig into the Bible and be transformed by it. See Teacher's Guide Unit 1 for lesson topics. 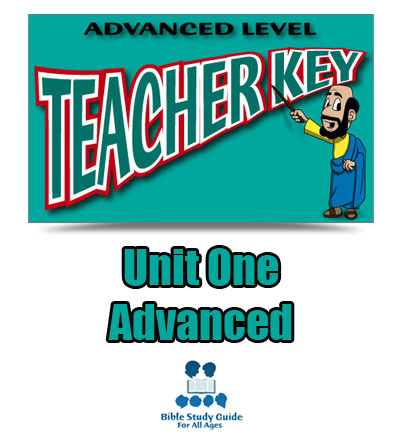 The Advanced Teacher Key has all the answers marked for the teacher, guidance for using the Unlabeled Wall Maps and Time Line and helpful background information. The Teacher Key is not required for using the Student Pages, particularly for home users. We highly recommend it for Bible class teachers. If you are using the Unlabeled Wall Maps and Time Line along with the Student Pages, this key is required. It will tell the teacher when to place labels on the Wall Maps and Time Line and when to take them off. 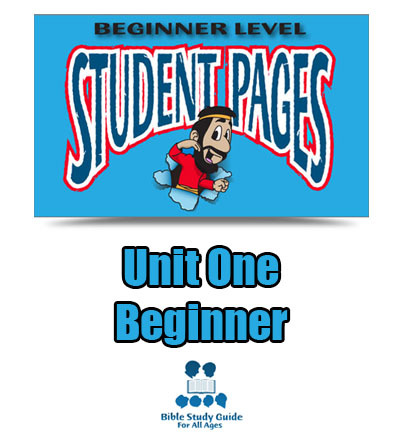 The Beginner Student Pages guide the students and teacher through the whole learning experience. The target age for this curriculum is age four through Kindergarten. However, these pages are flexible enough that three year olds and even first graders can use them, any student who does not read or whose reading level is very low. 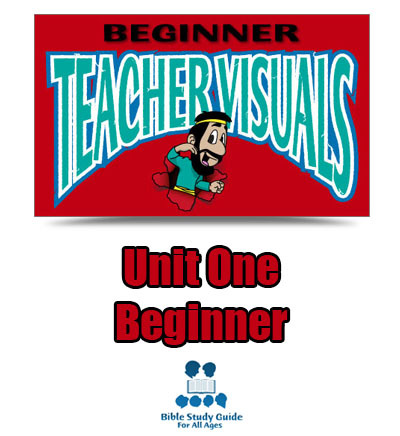 If you are teaching more than two Beginner students, the Beginner Teacher Visuals will help as well. See Teacher's Guide Unit 1 for lesson topics. If you have more than a couple of students, the Beginner Teacher Visuals make it easy to guide your whole class through the Bible lesson. They contain the "Discover the Bible" portion of the Beginner Student Pages enlarged on an 11" x 14" poster (sturdy card stock) with the Bible story and instructions on the back. The teacher may read the simplified Bible story, point to the visuals and show students how to do the activities as needed. See Teacher's Guide Unit 1 for lesson topics. 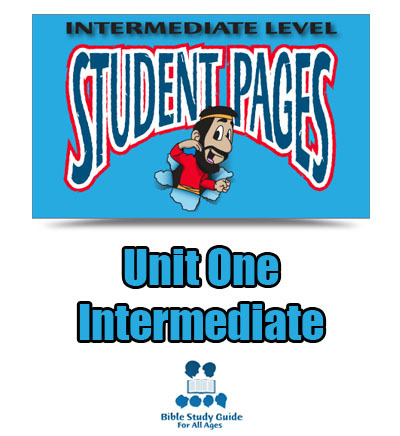 The Intermediate Student Pages guide students through the whole learning experience. The target age for this curriculum is third and fourth grade. 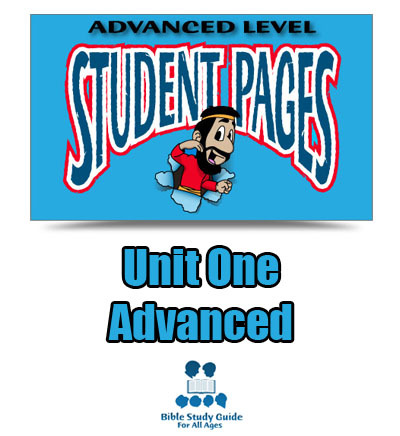 However, these pages are flexible enough to include students a little bit below and above that ability level. See Teacher's Guide Unit 1 for lesson topics. 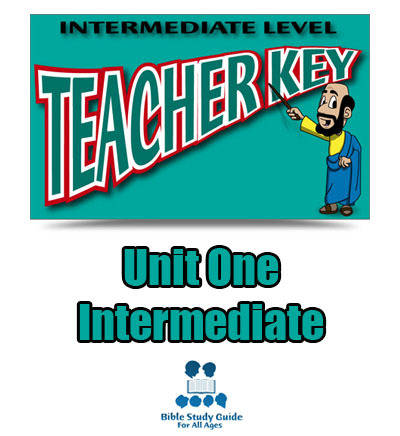 The Intermediate Teacher Key has all the answers marked for the teacher, guidance using the Unlabeled Wall Maps and Time Line and helpful background information. The Teacher Key is not required for using the Student Pages, particularly for home users. We highly recommend it for Bible class teachers. If you are using the Unlabeled Wall Maps and Time Line along with the Student Pages, this key is required. It will tell the teacher when to place labels on the Wall Maps and Time Line and when to take them off.